The following guidelines are designed to explain the CONTENT & MATERIALS that can be entered, along with the category names, rules, fees and deadlines for entry. The Voice Arts® Awards celebrate the best practices in voiceover acting, voice technology, creative direction, production, directing, casting, copywriting and audio engineering, throughout the many facets of entertainment, education, marketing, TV & Film production, spoken word, video gaming, animation, radio, virtual reality and the web. 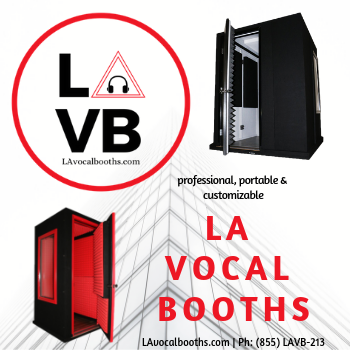 The work entered into the Voice Arts® Awards contest for 2019, must have been aired, broadcast, published or otherwise made available to the public or B2B (business to business) constituents between January 1, 2018 and June 30, 2019. “Demo Reel” and “Body of Work” categories are the exception to the eligibility rule, as they have no restriction on the time frame in which the work was created.) Demo Reels, however, will be judged according to contemporary, professional expectations for today’s marketplace. Therefore, it is not advisable to submit a Demo Reel that may be deemed outdated or obsolete. SOVAS™ reserves the right to determine the competitive viability of any and all entries submitted in any category. B2B includes corporate, instructional, marketing and other works that are intended for a non-broadcast or restricted audience. For example: An instructional video intended only for the employees of a given company would fall under the definition of B2B and is therefore eligible for submission. Categories may be entered by an independent artist, (non-company) or by a company (Corporation, LLC, etc) Entries are accepted from anywhere in the world , as long as the work is in the English and Spanish language. There is one exception with regard to language: The category OUTSTANDING BODY OF WORK – FOREIGN LANGUAGE excepts works in all languages. The following list represents an example of entrant types but this list is not exhaustive. Independent Artists (not a company) Voice Actors, Spoken Word Artists, Writers, Creative Directors, Producers, Casting Directors, Audio Engineers, Directors who are submitting on behalf of themselves and not in the name of a company. Any media work created using the human voice as the primary vehicle for communicating the intent, purpose and meaning to be derived from the work. Voices created via artificial Intelligence (AI) will be designated in categories segmented specifically for AI. See categories listed below. All work must be entered in a digital format. Please refer to the technical specifications within this document regarding physical and digital materials for submission and refer to the eligibility dates and categories for all other possible qualifying details. In the unlikely event that any individual category attracts fewer than 3 “award worthy” entries SOVAS™ reserves the right to withdraw that category from the competition or combine the category as we deem appropriate. If a category is withdrawn, the participating entrant will receive a credit towards future entry fees.No cash refund will be given. If, in any category, entries do not meet the minimum professional standard deemed “award worthy” by the jury, it is possible that there will be no award given in that category. The award statues to be given for any given award season will be the singular gold statue known as the Voice Arts® Award. Only a winner of a category and those credited on a winning entry are eligible to acquire the statue. Both winners and nominees are eligible to acquire plaques and certificates, which designate the status of “winner” or “nominee”. SOVAS™ will not be responsible for the holding of any materials submitted after the awards period, which concludes once judging begins. Submitted materials will not returned to entrants. 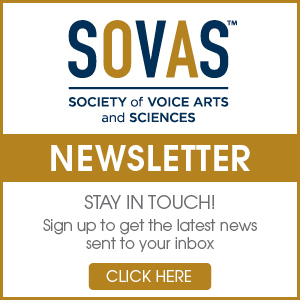 All submissions become the property of SOVAS™ to be used at its discretion, for the production and promotion of the Voice Arts® Award Gala and ceremony. ALL relevant permissions and copyrights are assumed to be cleared by the entrant. The organizers reserve the right to add, subtract, amend or otherwise revise any category during the course of the competition. Notices and updates of revisions will be posted on our website at www.sovas.org. Entries submitted as a campaign must consist of a minimum of two advertisements utilizing any of the following platforms: TV, Radio, WEB, In-theater, virtual reality, mobile apps and voice-assistant devices. Audio Book Recordings must have been reproduced originally or compiled from another medium for release as audiobooks. Qualifying audiobooks are determined by SOVAS™ to be sound recordings, in the English or Spanish language, where the written text is narrated (spoken), and the resulting recording is distributed for sale or public consumption. the work may originate in any country and provided in a digital format. It is not required that the original source of the Audiobook be derived from or based on a published book. The audiobook can be published/released prior publishing of a print version of the book. RIGHTS & DISCLAIMERS Entrants assume all responsibility for all rights and permissions to submit work on behalf of themselves and/or the owner of the works submitted. All entries must have been created as a work for hire, which includes pro bono work that can be verified as such by the hiring entity. i.e., non-profit organizations or institutions of learning. SOVAS™ retains the rights to disqualify entries which offend national, religious, cultural or racial sensibilities. All work submitted into the Voice Arts® Awards competition, is subject to use by SOVAS for as part of the awards program, as online samples on www.SOVAS.org and as promotion for the existence of SOVAS and the Voice Arts® Awards Gala. Submitted work may be used in whole or in part, during and within the live Voice Arts® Awards Gala (“The Show”). “The Show” may be streamed or broadcast by media entities attending the show and may be distributed by those entities through their own channels. * Fees are non-refundable, once the entries have been submitted. 20 Outstanding Spoken Word or Storytelling- Best Performance This category recognizes SPOKEN WORD as performances that focus on the aesthetics of word play, intonation and voice inflection. It is a ‘catchall’ which includes any kind of poetry recited aloud, including hip hop, jazz poetry, poetry slams and traditional poetry readings. It also includes comedy routines and prose monologues. 28 Outstanding Spoken Word or Storytelling – Best Spanish Performance This category recognizes SPOKEN WORD as performances that focus on the aesthetics of word play, intonation and voice inflection. It is a ‘catchall’ which includes any kind of poetry recited aloud, including hip hop, jazz poetry, poetry slams, traditional poetry readings, and can include comedy routines and prose monologues. 38 Audiobook Narration – Fiction – Best Spanish Voiceover FICTION (F): A work of fiction is created in the imagination of its author. The author invents the story and makes up the characters, the plot or story line, the dialogue and sometimes even the setting. A fictional work does not claim to tell a true story. This category is limited to those “Fiction” audiobook productions where voice acting (narration) is a primary communication technique. The audiobook must have initially been made available to the public during the eligibility period. Entrants may submit an unedited segment of the audiobook up to but not exceeding 15 minutes in duration. 39 Audiobook Narration – Non-Fiction – Best Spanish Voiceover NON-FICTION (NF): Non-fiction is content whose creator, in good faith, assumes responsibility for the truth and accuracy of the events, people, or information presented. Nonfiction includes all kinds of audiobooks biographies, histories, memoirs, how-to books, self-help, books on business, even books on writing. 41 Outstanding Body of Work, Foreign Language – Best Voiceover This category recognizes voice actors of any language, who have established a wide body of work in multiple voiceover disciplines over a career. The entry may include up to 20 minutes of work, where no single work sample exceeds 5-minutes. The work may span all voiceover genres: commercials, animation, promos, narration, video games, trailers, corporate, audiobook, consumer sales videos, live announcing, instructional, and other areas. The elements entered can be audio and/or video. There are no restrictions as to when any of the original work was created. The works will be judged by a media expert who is fluent in the language of the entry. 42 Audiobook Narration – Biography, Best Voiceover BIOGRAPHY (F/NF): Books in the Biography genre are a description of a person’s life involving more than just the basic facts like education, work, relationships, and death; it portrays the subject’s life story, highlighting various aspects of his or her life, including intimate details of experience, and may include an analysis of the subject’s personality. Biographical works are usually non-fiction, but fiction can also be used to portray a person’s life. 45 Audiobook Narration – Author Performance, Best Voiceover AUTHOR PERFORMANCE (F/NF): Narration is performed by the books author. All genres are eligible. 47 Audiobook Narration – Business or Education, Best Voiceover BUSINESS / EDUCATION (F/NF): Books in the business nonfiction genre are about the management and running of a business, or in the financial aspects of a business. Titles in this genre include how-to, step-by-step instructions about things one would need to know to start, own, and run a successful business, touching on marketing, taxes, etc. Titles may also include expose on general state of a given business category. Books in the education nonfiction genre can either be books about forms of education and how it’s achieved or be educational itself, in the form of text books and educational materials. 50 Audiobook Narration – Classics, Best Voiceover CLASSICS (F): A classic is accepted as being exemplary or noteworthy work that has demonstrated the ability to capture interests of generations of readers succeeding its creation. 51 Audiobook Narration – Fiction, Best Voiceover FICTION (F): A work of fiction is created in the imagination of its author. The author invents the story and makes up the characters, the plot or story line, the dialogue and sometimes even the setting. A fictional work does not claim to tell a true story. 53 Audiobook Narration – Self-help/Health and Wellness, Best Voiceover Books in the self-help nonfiction genre are based on one’s own effort and resources to achieve things and goals without relying on the help of others. The books in this genre can be about self-guided improvement in one’s economic standing, their intellectual state of being, and in their emotionally and self-worth state of being. They can also be about support groups, how to find them, and what they are about. Books in the health & wellness nonfiction genre are about the health and function of the human body and/or exercise and that focus on maintaining overall wellness and strength. The books in this genre talk about the function of the body and practices, foods, and medicines that improve them. They can also talk about what could be wrong and why. Books in the health genre are often written by health care professionals, like doctors, social workers, and psychotherapists. 54 Audiobook Narration – History, Best Voiceover HISTORY (NF): The history nonfiction book genre consists of events of significant change that happened in the past and the discovery, collection, presentation, and organization of the information. True accounts of actual events are the core of historical nonfiction. The books from the history genre can revolve around a person or event that impacted the lives of many in a positive or negative way. The comparison of past cultures and discoveries versus the culture and implications those discoveries had on current times are also relevant to the history genre. 56 Audiobook Narration – Faith Based or Metaphysical – Best Voiceover FAITH BASED/OR METAPHYSICAL (NF): Books in the inspiration nonfiction genre often have religious themed content and are sometimes an interpretation of a religious doctrine. They may also focus on affirmations of God’s impact on humanity and all else. The books in this genre may also be about people who have died, had an experience, and were brought back to life through medical help or divine intervention. METAPHYSICAL (NF): Metaphysical genre stories explore, or are based on, some form of philosophy or system of thought. Such fiction includes some aspect of the inner, incorporeal, supernatural, spiritual, archetypal or transcendent aspects of human experience and may emphasize an individual’s movement towards self-actualization. Readers may gain insight into, or be stimulated to reflect on, such things as the nature of existence, the mind, the soul, the psyche, psychology, the spiritual journey and so on. 58 Audiobook Narration – Short Story Anthology, Best Voiceover SHORT STORY ANTHOLOGY (F/NF): Books in the short story genre are made up of a collection of short stories brought together by author or subject matter that combines in total word count to a novel length work. * For Voice Arts Awards purposes, a minimum of four short stories are required for entry. 72 Outstanding Anime – Best Female Voiceover This category is limited to ANIME works produced for TV, Film or Web, recorded or dubbed in the English Language. Anime is a style of hand-drawn and computer animation originating in, and commonly associated with, Japan. The word anime is the Japanese term for animation, which means all forms of animated media. Outside Japan, anime refers specifically to animation from Japan or as a Japanese-disseminated animation style often characterized by colorful graphics, vibrant characters and fantastical themes. With consideration to the unique style that characterizes animation, this category is open to ANIME produced in any country. 73 Outstanding Anime – Best Male Voiceover This category is limited to ANIME works produced for TV, Film or Web, recorded or dubbed in the English Language. Anime is a style of hand-drawn and computer animation originating in, and commonly associated with, Japan. The word anime is the Japanese term for animation, which means all forms of animated media. Outside Japan, anime refers specifically to animation from Japan or as a Japanese-disseminated animation style often characterized by colorful graphics, vibrant characters and fantastical themes. With consideration to the unique style that characterizes animation, this category is open to ANIME produced in any country. 75 Outstanding Toy Character –Best Voiceover This category is limited to a single work sample (work for hire) where the voiceover serves as the voice(s) for a children’s toy, and where the toy has been publicly distributed within the eligibility period. Entrants must submit a video demonstrating the toy in use. The actor’s voice must be clearly heard and it must be clearly visible as to how the voice animates the toy. The judges must be able to gauge how well the voice work expresses the premise of the toy. Creativity, production and degree of complexity are all considered. 78 Outstanding Radio Imaging – Best Voiceover This category judges the qualitative impact of radio imaging, where the work is for hire and has been distributed within the eligibility period. The work can contain a single genre for a single station, or include multiple works and genres across different stations. 79 Best Web Site Any Web site pertaining to the topic of voice acting. This includes self-promotion for voice talent, voice actor fan sites, and any site where voice acting is a primary feature or topic of the site’s content, e.g., anime, animation, video gaming and audiobooks. The site must feature audible voice acting samples and/or content as a primary feature of its purpose. Work is judged on Design, Creativity, Intuitive Functionality, Ease of Navigation and Production Quality. The work entered must have been publicly distributed within the eligibility period. Graphic design, functionality, voiceover content and marketing effectiveness are judged. ENGLISH AND SPANISH IS ACCEPTED. 80 Best Voice Assisted Device, AI – Human or Machine Entrants must submit a video demonstration of the AI device being used by a person. Entrants may submit any electronic, digital or wireless device whereby the recorded human voice or Natural Language Generation (NLG) voice is used to assist users requesting information that is spoken in plain language and emitted by the device. NLG is defined as the use of artificial intelligence AI programming to produce written or spoken narrative from a dataset. NLG is related to areas of AI concerned with human-to-machine and machine-to-human interaction. The human voice may be used by itself or in combination with a computer generated voice. NOTE: in this category, it is possible and expected that the human voice may be competing against purely computer generated voices. The work entered must have been publicly distributed within the eligibility period. Clarity of speech, creativity, functionality and human sensibility are judged. **ENGLISH AND SPANISH IS ACCEPTED. *Additional information and categories, not defined here, will be available within the Award Entry Portal. Only the categories appearing within the Award Entry Portal are available for entrants. Please note that some categories from previous years may now be combined. § DISCLAIMER: Please note that nominees and winners in this category will be acknowledged online at SOVAS.com, listed in SOVAS press releases, and published in the event program distributed at the Voice Arts® Awards Gala. However, due to strict time constraints, the winner in this category will not be called to the stage during the Voice Arts® Awards Gala. Instead, the winner’s name will be announced from the stage and professional photos will be taken of the winner on the red carpet with the award in hand. All nominees will receive commemorative lapel pins.